Sigh…where to start? The barrage of bad news spewing out of the Premier’s office has been so intense that the government’s Machiavellian takeover of post secondary institutions and research and development slipped by with relatively little public outcry. Sure, some students and academics staged protests on the steps of the Legislature but the general public doesn’t know what the fuss is about. Is it higher tuition fees? No. Do the professors want higher salaries? No. Well what then? The PC government has recognized (yet again) that Alberta’s economic survival depends on a diversified economy. You mean we’re not going to be beholden to the oil companies anymore? Not so fast, grasshopper. A bit of background. In 2010 the Stelmach government set up Alberta Innovates to fund short-term, applied research under the banners of Tech Solutions, Bio Solutions, Energy & Environmental Solutions and Health Solutions. Three short years later, Mr Lukaszuk, Minister of Enterprise and Advanced Education, declared Alberta Innovates was, like a bad cup of coffee, not “totally satisfying”* and dismantled it. He rolled Tech, Bio and Energy & Environment (and their $160 million budgets) into a yet-to-be-named institute and spun Health Solutions off into Alberta Health Services. Midas Research is a centralized, top-down, government-driven research and development institute created to “help” post secondary institutions commercialize their research in partnership with private companies. Mr Lukaszuk says the research will focus on the “human, animal, agriculture and petroleum industries”. ** I have no idea what a “human industry” is. Midas Research will spin off companies and “help start a new economy for Alberta”. It will also generate a stream of royalties to fund post secondary institutions and benefit businesses. * Assuming of course that the creator of the intellectual property is prepared to give up his IP rights to industry, the university or the government in the first place. Bottom line: there’s no such thing as “basic research”. All research is geared to commercialization and the generation of profits, preferably within the current four year election cycle so the PCs can take credit for it. As an aside, aren’t you glad Alexander Fleming wasn’t pursuing a government-driven/corporate R&D agenda when he discovered blue green mould growing in a contaminated petri dish; he’d have tossed it in the trash! When Mr Lukaszuk unveiled the Midas Research Institute he also announced that 26 post secondary institutions would not receive a promised 2% budget increase; instead they’d be whacked with a 7.2% budget cut. As a result the $147 million originally slated to go to post secondary institutions is looking for a new home…Midas Research perhaps? 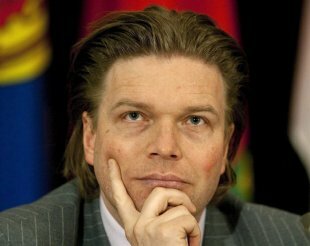 Mr Lukaszuk says don’t worry, his department, nay, his very own office, will make the final decision on the cuts. He’ll review the list of programs to be cut, check the enrolment levels and decide whether the programs can be “delivered to students in a different fashion” or at different institutions**** Oh I get it. A course is offered if Mr Lukaszuk says it’s offered. A course is cut if Mr Lukaszuk says it’s cut—so much for the independence and autonomy of our universities, colleges and technical schools. Mr Lukaszuk is the Minister of Enterprise and Advanced Education. He dismantled Alberta Innovates which provided applied-research in accordance with government priorities and replaced it with the Midas Research Institute, a university/government/industry collaboration to provide applied-research in accordance with government priorities. At the same time he imposed a $147 million reduction in post secondary funding. It’s clear that Mr Lukaszuk’s mission is press gang our academics and researchers into serving industry. Those who would prefer to do basic research or teach in a post secondary institution with some level of independence and autonomy need not apply to Campus Alberta. The model doesn’t result in wealth-creating research, but it does create an exodus of top scientists, clinicians and professionals. And that Mr Lukaszuk is a “brain drain”, not a sustainable economic advantage. **Mr Lukaszuk in an interview with Mike Spear, of Genome Alberta, at the Bio Buzz Conference, (Biotechnology Industry Organization) in Boston earlier this year. This entry was posted in Education, Politics and Government and tagged Alberta Innovates, Budget, Dr Bob Church, Lukaszuk, Midas Research Institute, Research & Development, Stelmach. Bookmark the permalink. A great entry – as they all are. Bravo! Thank you Ian! I really appreciate your support and wish all of our friends and colleagues at the U of C, the U of A and all post secondary institutions in Alberta the best of luck in these troubling times. Scary to say the least and chasing well trained people away shouldnt be tolerated. Think most folks have had enough of this gov’t and are just sitting back and saying to themselves “when are these night mares going to end. Tom, you’re right, even the PCs have had enough. I’ve heard that at least six PCs (including that dolt Lukaszuk) are going to challenge Redford at the leadership review meeting in November. As I understand it, the leadership review process requires each PC constituency association to name a bunch of delegates who will go to the meeting and vote on whether Redford should continue as leader. The tricky part is there is no mandatory threshold she has to meet in order to stay on as leader. Klein voluntarily stepped down when he got a lukewarm 55% support rating, but I’m betting Redford will fight tooth and nail to stay in power and will have to be pushed out if her rating is in that range. Should be very entertaining. very well said, as usual. Hate what Lukaszuk and his PC buds are doing to postsecondary. I agree Deb. When the opposition challenged Lukaszuk by citing Dr Church’s view that “Campus Alberta” was a rehash of the failed 1972 Soviet experiment, Lukaszuk responded that he’d go with “our professors at the universities” (obviously not the U of A professors who commented on the “Whither the U of A” blog) and “the individuals I met with in Lake Louise over the weekend, who are the top researchers in Canada and Alberta who are looking at collaborative research not only with the private sector but with other institutes throughout the world”. One wonders who these unnamed individuals are. He then reiterated the PC call to arms: find real solutions to real problems and commercialize them and take them to market. Translation:Basic research be damned. Very short sighted and extremely dangerous. I am trying to figure out what we Albertans can do to try to salvage the next three years until the next designated provincial election. The speed at which this government ship of fools is destroying our province, our economy, our people and our reputation is simply beyond comprehension. The cute coinage of terms like “bitumen bubble” and “Campus Alberta” might make for good advertising slogans, but there is no substance and no logic behind the pretty words. In fact, the logic as you explained in the latest brain storm of Minister Lukaszak will actually runs counter to everything the government is bragging about…diversify the economy, increase revenues, become world class etc. There is the age old debate about whether jobs follow people or whether people follow jobs. However you attempt to resolve that equation, a city or region needs to have certain conditions that will attract either jobs or people. Some key elements, as Richard Florida and other new age types suggest include healthy cities, a strong primary education system, a fulsome arts and culture scene, an environmental sensitivity and an internationally recognized post secondary education system. So far, this government, has ignored its two largest cities containing more than two thirds of the provincial population, cut primary education, removed the “public interest” test from legislation and put the fox in charge of the environmental henhouse and finally is now attempting to turn our post secondary education into a failed USSR model. Any chance of enticing people to come to this province and to make their home here has been eroded so badly with the efforts of this 14 month old government. If they keep up their pace of destroying all we value under the guise cute PR terminology, we will be lucky to hold onto our present residents let alone attract new ones. Great comments Mr Soapbox (Disclosure: Roy is Ms Soapbox’s husband and a city planner to boot). I agree with you about the importance of creating healthy cities brimming with opportunity for residents and newcomers alike. In the Bio Buzz interview Mike Spear asked Lukaszuk to explain how he’d attract biotech businesses to the province. Lucaszuk listed three attractions: Alberta’s “fiscal positioning” in Canada and the world (I have no idea how he reconciles that with going into debt to fund basic infrastructure and operating expenses), its “very stable government” (yes we’re not in a state of revolution…yet…but we have no sustainable long term spending plan, preferring to rise and fall with the boom/bust cycle) and its “phenomenal post secondary research institutes” (which he’s just undercut with the Midas Research Institute and Campus Alberta). No clear vision, no strategy and no holistic view of anything.
. Thanks to both of you. Great Archive. I am happy to discover your blog and tweets, Susan! (via your comment on the Whither blog). Thanks! Keep it up! Ryan, welcome aboard! A friend told me about the Whither blog, it’s excellent. Now I’m going to pop over to my post on the Redford Keystone ad to respond to your insightful comment. I was raised and educated in the USSR and I honestly can not see why what Mr.L. is proposing is a soviet model. It is much worse, I am sorry. I was educated in USSR in fundamental science, and this fundamental science at the universities was funded extremely well and was not ruled by government (gosh, only one my alma mater university had more permanent researchers in my field – one of the basic sciences – than the whole Canada has now). The exodus started only then the funding stopped – this happened in the *post* soviet era when idea of market and profit in education came to Russia *from the west* and government started to expect a profit from any government funded research. You confuse it with that USSR also had *lots* (thousands) of additional defense and industry laboratories, where people worked on government projects (they also were paid much better than researchers at universities). This however did not affect university based research and was *in addition* to that. Canada does not want to pay for any similar laboratories (existing institutes and labs can be counted using finger of two hands), and hence PCs want to make universities working in this frame instead. Basically, Canadian government wants to have it all cheap. That’s it. USSR spent a way larger GDP fraction on science, and what Canadian government spends is totally ridiculous for a developed country. Thank you for clarifying the Soviet approach to research! I agree with your conclusion that Mr Lukaszuk’s proposal is much worse. Mr Lukaszuk starts with the premise that government dollars are scarce (although there are plenty of government dollars to go into corporate welfare, but that’s a discussion for another day) and as a result he must shift government funding away from basic research and into applied research which will take place in the Midas Research Institute. Government dollars are so scarce that the dollars originally slated to go into post secondary education must also be sacrificed. My concern with Mr Lukaszuk’s proposal is that unless a researcher is interested in working for, say, Pfizer, on a pill that might improve someone’s quality of life he will not find a place in the research labs or the universities in our province. Furthermore even if the researcher is happy to work for Pfizer, his continued employment depends on Pfizer renewing its commitment to the Alberta-Pfizer Translational Research Collaboration project on what appears to be a year-to-year basis. If the Alberta government is sincerely interested in creating a knowledge economy as Mr Lukaszuk proclaimed in his BIO Buzz interview then it must commit to a sustainable funding program for post secondary institutions and research facilities with no strings attached. I appreciate you sharing your insights with us. Well I have to say that I like the little radical thinking I find on this post. People in general are affraid of being politically incorrect or a bit too agressive and the results are that we are a province that just cannot react to an incompetent govenment. I agree to a certain degree with exrussianprof that this is way worse than the ex-Soviet approach to fundamental sciences and the proof of that was what happened in the 60s when the US realized that Soviet science was way ahead of them. The only reason it did not continue ahead of them was the dismall administration and the decrepit system that evolved in the Soviet Union afterwards. The real issue is that we gave the control of our Advanced Education system to Lukaszuk, who seems not to be able to run a soup kitchen, never mind an educational system. I personally think this is the problem with the voting system with the winner gets all where anyone with money and resilience can get in and then be chosen to run entire departments. People here criticize the party list system used in some Proportional Representation systems but the fact is that the best people in the party are chosen to serve the prime minister. The main reason is that with the list we do not even know these people but the fact is what do we really know of the people that run in our constituencies? I have not known any that run in mine. Lukaszuk is not skilled to run a ministry like Advance Education and should not be there period. Alison Redford is even worse because she should know that. Susan the knowledge economy that this government says it wants to create is probably the spin knowledge they so much need to survive these days. This is not just the government responsibility. As Albertans we do not stand up to these snake oil salespeople. Well one day I will learn how to use this correctly. I made corrections but somehow let the old one be saved. On the sentence that starts ‘ The main Reason……. I meant to say that the PR critics point out that with the list we do not know the people but the fact is what do we know of the people that run our constituencies now? Carlos, you nailed it when you said that the PC’s talk about building a knowledge economy is nothing but puffery. I’ve asked some of my PC friends (smart people, incidentally) how the PCs plan to lift our economy out of debt if the oil and gas industry continues to languish. What’s Plan B? The answer is always the same “we hope that commodity prices (oil and natural gas) will improve, the differentials will narrow and Keystone will be approved”. In other words, there is no Plan B; just a hope and a prayer that the market will turn in our favour and President Obama approves Keystone. Given that we all recognize that Alberta cannot continue to sustain the numbers of people moving into the province (and aging in the province) without a sustainable revenue stream, I would have expected some serious action on diversifying our economy and developing a path that gets us out of the boom/bust economic cycle based on the extraction of fossil fuels. Peter Lougheed and countless others after him stressed the need to do this, but Alison Redford’s PCs just don’t have the imagination or the will to get there. Until we replace this government with one that is not beholden to the oil and gas industry we’ll be stuck in this pathetic cycle forever. Well Susan there you have it – ‘I DID NOT KNOW’ – this is all that our prime minister had to say about the senatorgate. A man that controls everything just did not know!! I love it. We are like the Roman Empire, just dirtier. This is just another way to make sure that science answers the ‘right’ questions while raising as few as possible of its own. So. A bit OT, but is the Premier heading to the Grove to hobnob in secret (totally on behalf of Albertans, natch) with her fellow Bilderbergian Elites again this year? I only ask because as far as I know we are still waiting to get our money’s worth ($19000- should at least warrant some hockey talk about it) and hear what untold benefits we reaped from the meeting she attended last year. That is one expensive page! Perhaps a little off topic but terribly relevant given the Mike Duffy/Nigel Wright fiasco. The reason I raise this is not because Mr Wright wrote the $90,000 cheque (that showed extremely bad judgment and said volumes about how the PCs operate) but rather because I knew absolutely nothing about Mr Wright until the scandal broke. What I learned was that Mr Wright wielded tremendous influence with Mr Harper. By all accounts he’s brilliant, hardworking and likeable. I’m not surprised that he was a good sounding board for Mr Harper, but it does demonstrate the influence that people behind the curtain have on government policy. This is why GoinFawr’s comments about Bilderberg are so important. Bilderberg, Davos and other groups are run by tremendously powerful people who are smart enough to know that they need political support to achieve their own corporate goals. Alberta’s politicians should know this and balance the “input” they receive at Bilderberg with the “input” they receive from the people of Alberta. The first step would be a fulsome report on what Ms Redford learned at Bilderberg. But as GoinFawr points out, instead of transparency Albertans were treated to a one pager which said absolutely nothing. Is it any wonder Albertans are cynical about the political process? The Premier’s participation advanced the Alberta government’s more agressive effort to engage world decision makers in Alberta’s strategic interests, and to talk about Alberta’s place in the world………. Interesting vision. World decision makers? Who are they? Are these prime ministers by any chance? hmmm very nice. No one is allowed in to find out who the decision makers are but that is ok, I guess they are Alison’s friends and so Alberta’s friends!! Engage these secret friends in our strategic interests? Who told Alison we want her friends involved in our interests? Carlos, I wish I could find the clip that was running in movie theatres across Alberta. It showed a corporate executive thanking Albertans for allowing him to take our resources at rock bottom prices and at the expense of our hospitals, schools, etc. It ends with his secretary sprinkling gold dust into his coffee. Very powerful and in keeping with your comments above. Thanks Ryan. I was talking with a friend about how difficult it is to get the key issues into the public’s mind and I remembered this clip. Her response was “fight fire with fire”; hire a top notch PR firm to help craft the message and communicate it effectively. Great idea…the tricky part is finding the funding. I’m going to ponder that, and in the meantime share this clip as broadly as I can. Susan I saw that clip a couple of times and I thought it was excellent. I believe it is sponsored by abetteralberta.org or some name similar. Usually I do not care for political clips but I thought this one was well done. Susan I like the idea of this type of communication in the movie theaters and TV but I think it costs a fortune. The people that created this clip are the Alberta Federation of Labour and Public Interest Alberta. Although they do not have deep pockets they can certainly cause some damage. Had I done the clip I would have been way more agressive without being negative because lets face it our royalties and tax arrangements with the big oil companies is to say the least legalized robbery of our resources. This kind of abhorrent deal is what caused the revolution in Libya and Venezuela. Here it does not happen because we are just too polite. We are too civilized. We do not like to raise our voices it is not appropriate.The Bilderbergians know that very well and that is why Alison Redford is now a guest in their inner circle. Agreed. I thought the clip had a lot of impact and hope that others who saw it feel the same way. It’s hard to tell what will hit a nerve with the voters nowadays. Your point about Canadians being too polite is well taken. I may have mentioned it elsewhere but last month when I was in Washington DC I heard the former ambassador to Canada give a short talk. He referred to the Keystone XL pipeline and said that Canadians are far too polite. He said if the situation were reversed the Americans would be hollering their heads off. Think we could learn something from our neighbours to the south without becoming quite so extreme?